Urbanscreen projection is an artistic approach to the main motto of the 50th film festival of Thessaloniki, “Why cinema now?”. Through their eyes cinema is de constructing on the façade of “Olympion” and reconstructing in a way that any viewer could give his own answer to the question. Urbanscreen conceive and produce custom-made media installations using high artistic standards, an architectural approach and a consistently professional completion; in doing so, creating uniquely outstanding impressions. In order to achieve it in Thessaloniki they teamed up with Alphavision, by using their equipment and technical skills. Alphavision’s experienced audiovisual department worked with Urbanscreen, providing the necessary equipments, two Cristie LX-1500 projectors with 15000 ANSI lumens, high performance special lenses and skilled technicians for a 10 days support. The result you can see it in the video above or below. The Thessaloniki International Film Festival, is celebrating its 50th anniversary. Their goal for this year was to use innovative and new forms of media. They chose Alphavision, a distributor of C-nario in Greece and Bulgaria, to operate a network of 20 locations through Film Festival’s premises including 8 Hotels hosting festival guest. Alphavision teamed up with Dataways, a local firm in telecommunication sector, for the VPN, and TNT productions , for content creation. Alphavision is operating a system which runs in LED, Plasma Screens and projectors, in locations where the festival is being held, at the Harbour Warehouses of Thessaloniki , at Aristotelous central square of Thessaloniki, at the building “Olympion”, and in additional 1404 hotel rooms TV screens through 8 hotels TV Matrix. 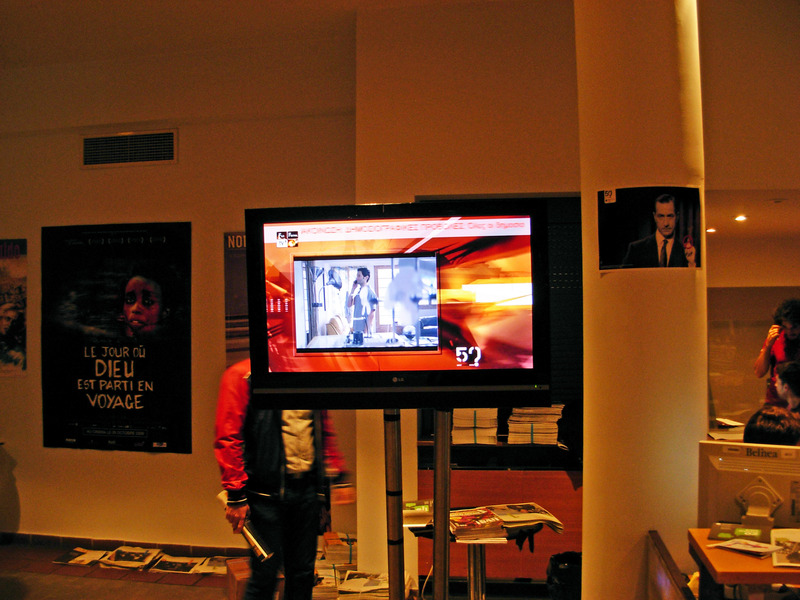 Alphavision used Dataways VPN in order to connect the 8 hotel players with the Film Festival network, so that the festival guests, which occupies 1242 rooms, can watch the FFTV channel in their own TV set. Under the supervision of the director K.Avgeris ,TNT and a number of professional TV crew which are spread in the city in order to cover all the events, masterclasses, film reviews etc in order to provide material for the production team. Content is updated many times per day. What is really interesting is the live streaming of FFTV channel in the official site of the film festival that Alphavision provided through a player, to their streaming server.Viewers all over the world can watch live FFTV channel at the first page of the 50th Film festival or directly from Livestream.com, here. This complicated project, unique for the digital signage status in Greece, was designed and operated by the experienced stuff of Alphavision. The uniqueness is based on the number of the screens which is displayed (over 1400), the number of different locations and display forms, volume and update of content, the number of people that is working every day in every sector of the production.